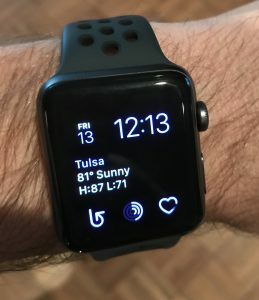 Back in October 2017, I posted a quick review of the Apple Watch Series 3. The review was more hope than review as I hadn’t had a chance to put the device through its paces, and the biggest question hanging over the review was battery life. After working on my 5K speed for a while, I finally had the opportunity and weather to go for a longer run outside. I left the house around 4:00 PM without having charged my watch since putting it on in the morning. I ran with my AirPods connected to and playing music from the watch. My phone was sitting at home in Airport Mode. Unfortunately, I forgot to look at the battery life immediately after the 1 hour and 40 minute run as I stayed out to hike Turkey Mountain with my wife afterward. It wasn’t until about 8:30 PM that the Apple Watch informed me that its battery life was down to 10%. To be completely candid, I am not a heavy Apple Watch user outside of running. I rarely use it for anything more than looking at the time and weather or reading incoming notifications. As I sit here writing this post, it’s 5:45 PM, and my watch shows 78% battery remaining so it was probably in the 80% range prior to my run. On the run itself, I was using NikePlus to track both the normal running metrics and heart rate. The Apple Watch had cellular turned on, and I sent and received a few text messages during the 3 hours I was away from my phone. And like I said above, the watch was playing music through my AirPods for the duration of the run. In my previous quick review, I said that 2 hours of battery life was the absolute minimum I needed for the Apple Watch to be a good standalone tracking device. Based on my experience yesterday, I believe 3 hours is a reasonable expectation, possibly significantly longer if you skip AirPods and music. Well, I did it. 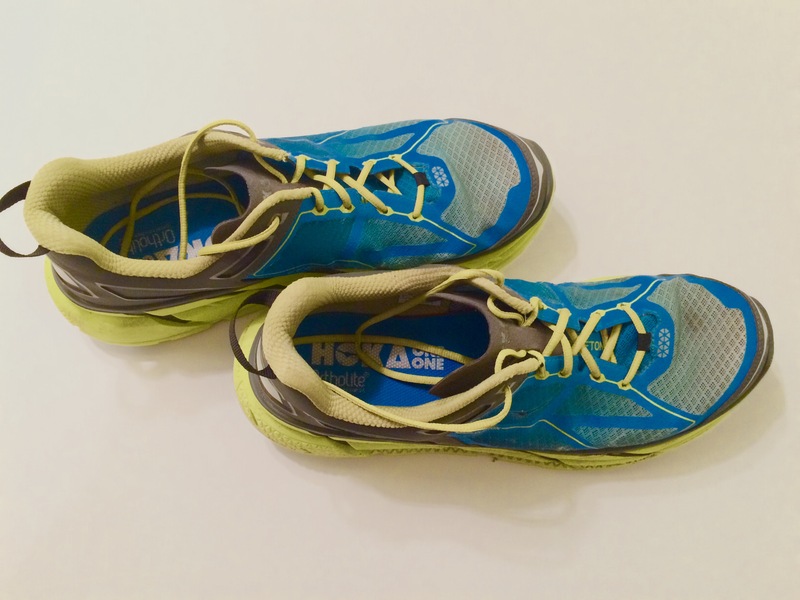 During my last marathon training cycle, I finally tried a pair of Hoka One One shoes. When I first began running, I was a typical heel-striker unless I was sprinting. In an attempt to stave off persistent lower leg injuries, I switched to a mid-foot strike with the help of Vibram’s and Newton’s. Shortly thereafter, I was amazed to find my chronic knee pain had subsided. This wasn’t pain I developed as a result of running but pain I had endured most of my adult life. I was officially a member of Team Minimal Cushion in time to witness the birth of Team Max Cushion. I’ve tried on the Hoka Clifton a few times, but I just couldn’t understand what all the fuss was about. They didn’t feel right on my feet, and like most other heavily cushioned shoes, I found the lack of stability disturbing. Regardless, I decided to dive in wallet-first and try a pair of Clifton’s, the model I had heard the most about online. Even though the Clifton 2 had already been released, I ended up with the Clifton 1. For whatever reason, the Clifton 2 felt drastically different between left and right so I went with the Clifton 1. 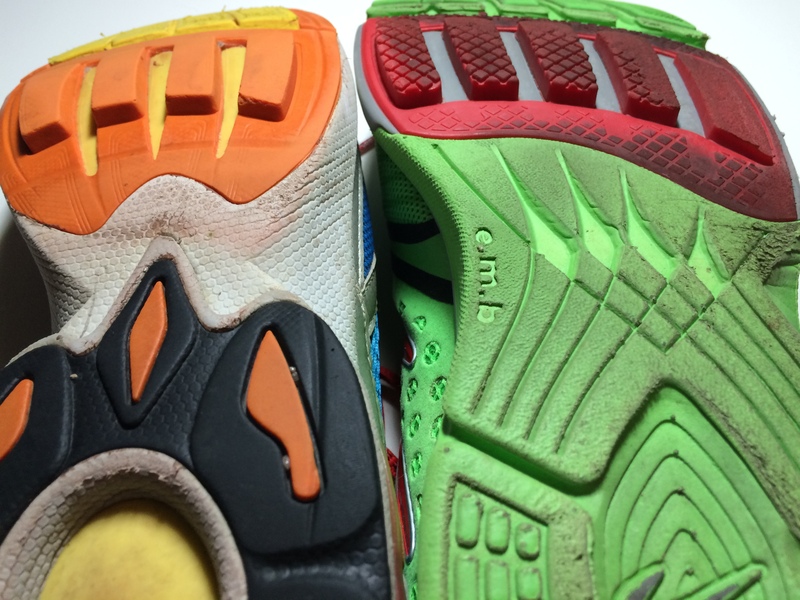 Looking back, I wonder if the Clifton 2 at the local running store may have had different insoles in each shoe. The Clifton 1 came with 2 insole options so if the Clifton 2 is the same, the previous shopper may have been experimenting. Regardless, I was happy testing the Clifton 1 because it seems like it’s the shoe that kicked off the maximal trend. The main difference between the Clifton 1 and 2 is the tongue of the shoe. The Clifton 1 has what feels more like a thick piece of leather as a tongue whereas the Clifton 2 has a fairly traditional, cushioned tongue. I can understand why people didn’t like the Clifton 1 tongue, but I actually liked it. The thick leather seemed to spread out the force of the laces and make it more comfortable on my feet than the thick, softer tongue of the Clifton 2. How can I not jump straight to the cushioning? That’s really what this or any Hoka review is about, right? Between August and November, I put in about 400 miles training for the 2015 Route 66 Marathon. At least half of those miles were in the Hoka One One Clifton. During the first several long runs, I honestly considered giving up on the Hoka’s. Nothing felt right. I was slower and felt like I was exerting more effort than normal. It was like running in quicksand. I don’t remember when that changed, but the first hint was on a downhill during one of many long runs. I don’t like running downhill, and I alternate between trying to go with the flow and applying the brakes. On one of my downhills in the Hoka’s, I realized I was running aggressively downhill without any discomfort. As my confidence grew, there were times I was pushing my downhill pace into the low 5’s on steep enough hills. Considering I was attempting an 8 min/mile marathon pace, that’s pretty quick for me, even downhill. Shortly thereafter, I noticed a similar change on the uphills. Keep in mind that I like running uphill, and I find minimal shoes great for running uphill. That said, on the same hill where I was hitting low 5’s downhill, I found myself bounding up the hill near the end of a 20 mile run and feeling surprisingly good. I don’t know which of these changes can be attributed to the shoes and which can be attributed to the volume and quality of training. All I know is I wasn’t a fan of maximal cushioning, but I grew to appreciate its benefits on my long runs. If I were lacing up for a 5K, I would never wear the Hoka’s, but at half marathon distance or longer, soft, maximal cushioning like the Hoka One One Clifton 1 is definitely worth consideration. Unfortunately, there is one glaring problem with the Hoka One One Clifton 1’s and most Hoka’s from what I’ve seen. The toe box is way too small. Before you object, hear me out . I’ve run in a variety of shoes, both traditional and minimal, trail and road. 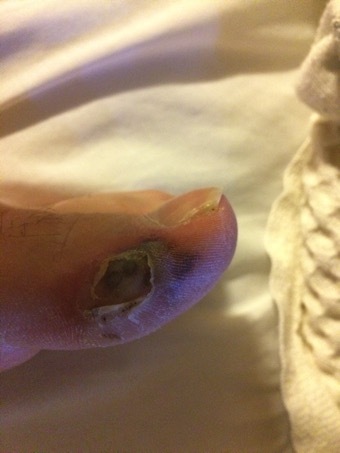 In 5 years of running, I have never bruised a toenail, much less lost one. Actually, in all of my 42 years, regardless of the sport or activity, I’ve never bruised or lost a toe nail. So what’s my secret? Ridiculously tough toenails. Seriously, that’s it. Most people struggle with their big toenail, and my big toenails are just tough. If I don’t have the extra heavy duty toenail clippers, the odds of bending the clippers versus cutting the nail are about 50/50. Gross, right? The other toes are softer, but most of them also curve with the shape of toe instead of sticking out straight so they don’t take much impact. Around mile 20 of the Route 66 Marathon, I knew that was going to change. 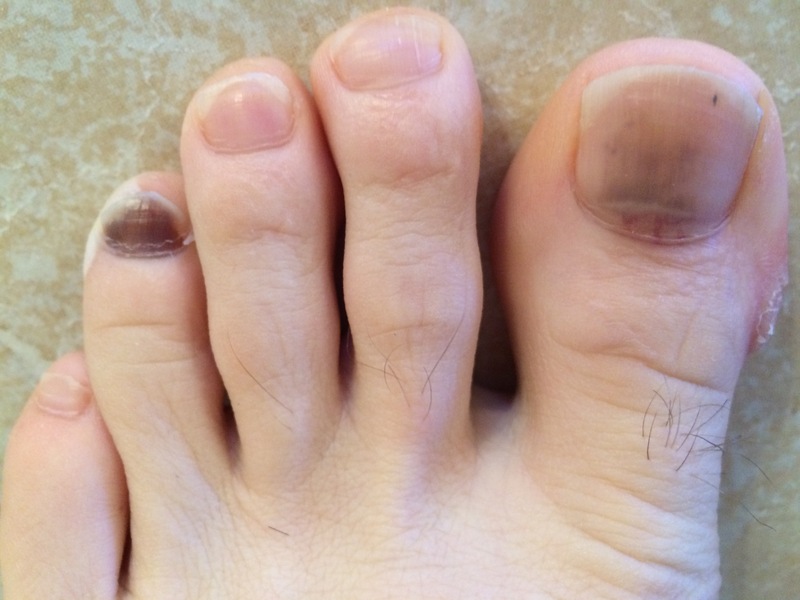 At the end of the race, I had 3 bruised toe nails. The 4th toe on my left foot and both of my big toes had bruised. A short 6 weeks later, I lost the nail from the 4th toe, but the big toenails look like they will survive. I know some runners wear lost and bruised toenails as a badge of honor, but I consider most bruises and blisters the fault of bad equipment. The Hoka One One Clifton upper is reasonably comfortable and breathes pretty well. The only problem I ran into beyond the size of the toe box was a hot spot on the inside of my right ankle. Given that it showed up on only one foot I suspect this was a manufacturing defect. A properly positioned bandaid prevented the blister, but seeing as I always forgot to put the band aid on, I now have a nice Hoka spot on my foot that seems to be in no hurry to go away. Underneath my foot, the Hoka One One Clifton performed well. Traction was good, and the Clifton easily handled a few miles of trail running during my long training runs. It surprised me that I could feel the ground so well running on the trails. The trails here are rocky, and though you could feel the rocks for proprioceptive feedback, the soles were durable enough to protect the foot from injury. The insoles included with the Clifton could use some work. As I mentioned above, they included 2 models. The default was more molded to the shoe and more comfortable on my foot. 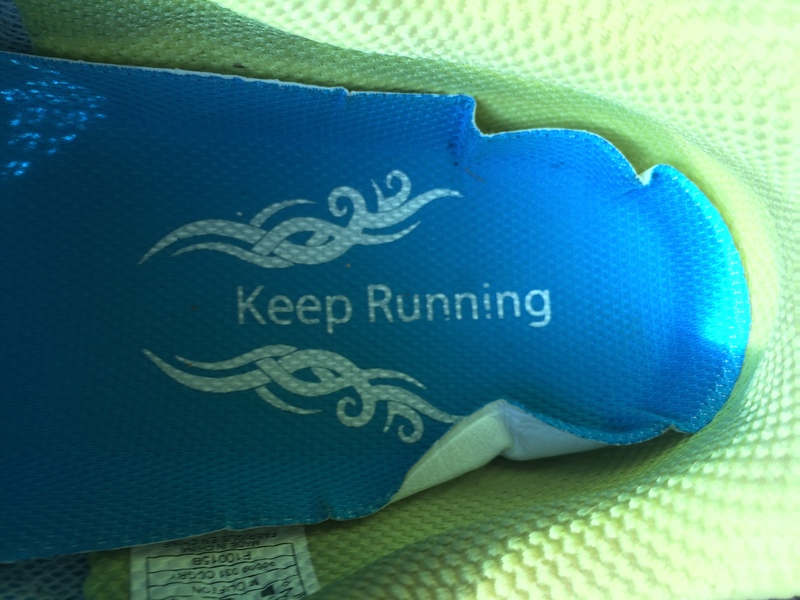 Unfortunately, after about 50 miles of training in the shoes, those insoles decided they had had enough and tried to walk out the back of my shoes during a run. After that experience, I looked around online and found I wasn’t the only one who had experienced problems with Hoka’s insoles. 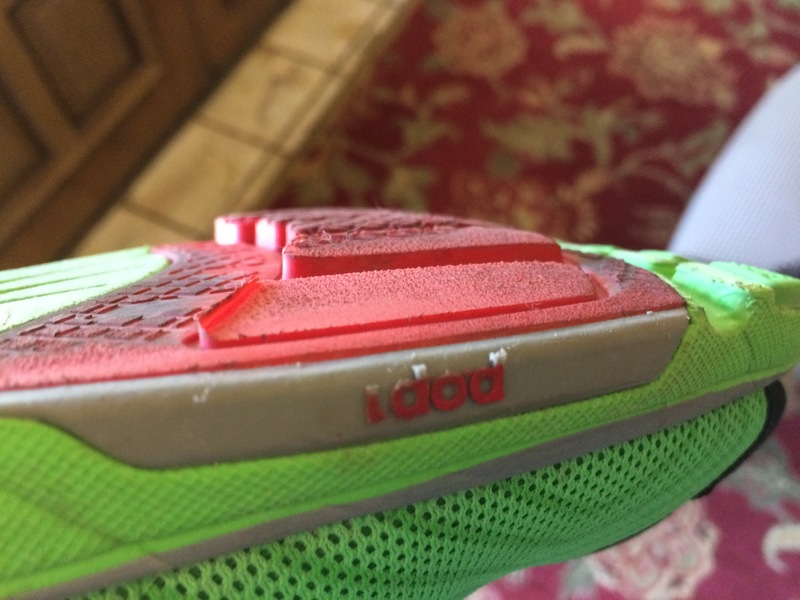 Hopefully newer Hoka shoes have solved this problem because it’s pretty aggravating to find yourself at mile 5 of a 10 mile run with insole sticking out the back of your shoes. As far as the feel of the shoe, I’ve not noticed any dropoff in the Hoka One One Clifton. Now closing in on 300 miles, I don’t see any reason to retire them. The outsoles are taking a lot of damage, but it’s not affecting the ride in the least. It might affect the off-road traction after a while, but since these are road shoes, it seems inappropriate to judge them based on trail performance. 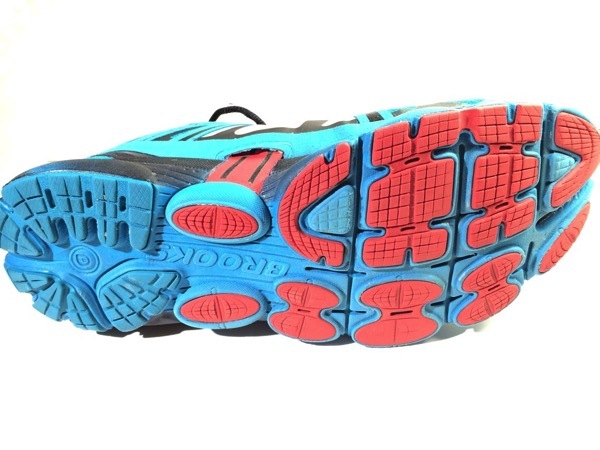 Though I generally liked the way I ran in Hoka’s, I will never buy again unless they change the toe box dimensions. What I find amusing is I went into this review leery of maximal cushioning and especially the potential for rolling an ankle in a maximal cushioned shoe. I came out of this review only having rolled an ankle in minimal shoes (looking at you Nike Free), appreciating the maximal cushioning for helping me run better downhill, but disliking the shoe for a very boring, traditional reason….fit. Well, this is unfortunate. The Newton Distance S III is my 2nd pair of Newton Running shoes, and I absolutely loved them except for a couple of glaring issues, one of which may keep me out of Newton’s shoes permanently. Let’s get into it. When you read the rest of this review, you’re going to wonder why I buy Newton’s at all. It’s the POP. I know some people have mixed feelings about it, but the lugs that make up their POP system work for me. 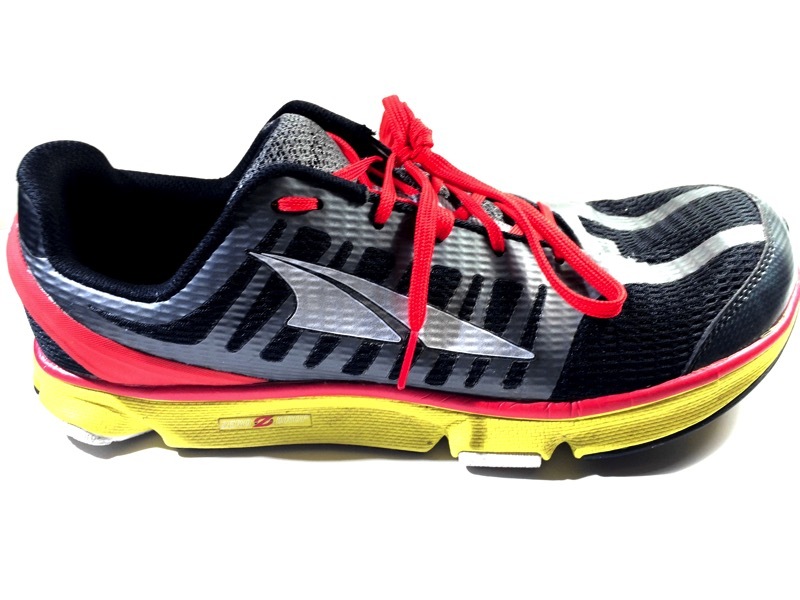 I feel faster with less effort in Newton’s than in any other shoe. I can definitely match my speed in a similarly weighted pair of shoes, but it will feel like more effort. If I want to test my 5K or 10K PR, I would definitely want to have on a pair of Newton’s. The only reason I didn’t keep training in Newton’s following my first pair in 2012 was due to the 4 lug system. It always took me a couple of miles to feel comfortable, and they never felt all that stable to me. More recently, however, Newton introduced 5 lugs. The change solved all of my issues with running in Newton’s. 5 lugs felt extremely stable, and I still felt the same speed and endurance benefit from the trampoline effect of the lugs. I have never felt compelled to contact a shoe company about the durability of their product until the Newton Running Distance S III. Why? It should be obvious in the above picture. The outer lug on only my left shoe wore down almost completely within the first 120 miles of use. Let me say that distance again: 120 miles. I don’t know exactly when the lug wore down. It might have been 50 miles, or it might have been 100 miles. Either way, it was not 500 miles. The older Newton Gravity pictured alongside my Newton Distance has over 500 miles on it, and there is almost no wear to any of the 4 lugs. They’ve lost some of their pop, but I bet I can still run in the Newton Gravity for another 500 miles. I’m at over $1/mile in the Newton Distance S III. So I contacted Newton Running support to see if they had an explanation. Without looking at video of my stride or asking any further questions, the support agent diagnosed me as a supinator and told me I should be in a neutral shoe instead of a stability shoe. My old Newton Gravity are neutral shoes, and I knew I had more outside wear on most of my shoes so I accepted the explanation and went on my way. It really kept gnawing at me, though. Why do NONE of my other shoes show a significant wear pattern difference between left and right shoe? Why did the local running store identify my foot strike as neutral? 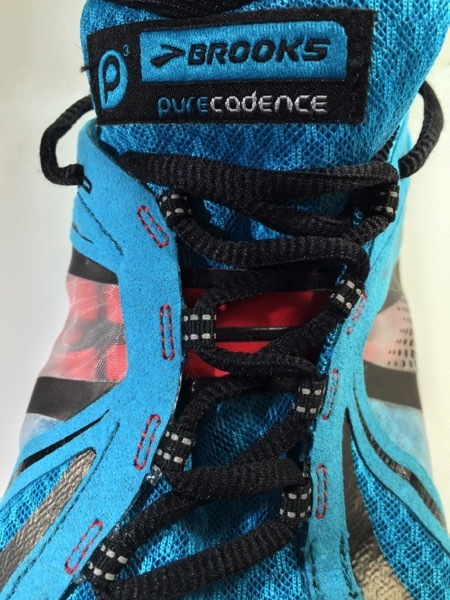 Why did stability shoes solve a lot of lower leg problems I was having in neutral shoes? I’m not sure why it took me so long, but clearly it was time to shoot some video on the treadmill and see what was really going on. I spent some time researching pronation and supination to make sure I understood fully after seeing this video. The basic difference is which way the ankle moves when you land. With pronation, your ankle will shift inward as your weight transfers toward the ball of your foot and big toe. With supination, the weight transfer doesn’t happen, and your ankle might shift outward on impact. As you can clearly see, I pronate. On the left side, it is more pronounced. This is due to my right ankle injury, and the hardware holding it all in place. 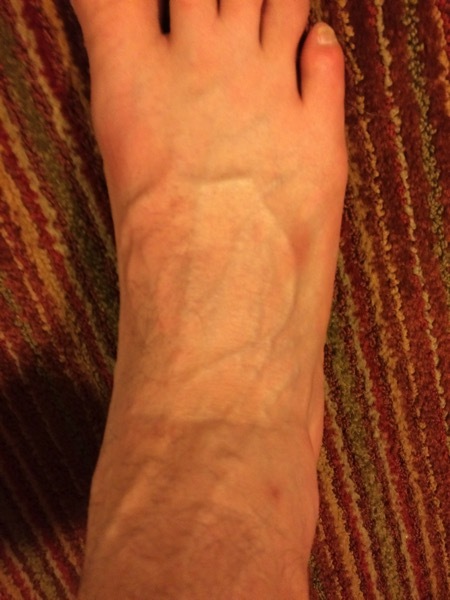 My right ankle can only move so far before the internal hardware says it can’t go any further. You can also see that I land initially on the outside of my midfoot. 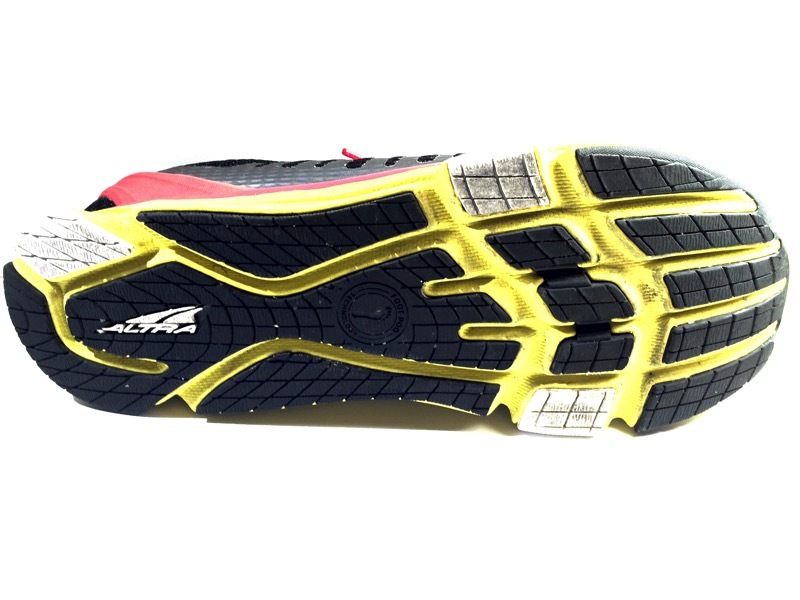 With a heel strike, that landing would show up in the tread on the outside of the heel, and then the pronation would show up with wear on the inside of the forefoot. Looking back at my first pair of running shoes from when I was still heel striking, you can see exactly that wear pattern. Most of my walking shoes also show the same pattern. The outside of the heel wears first followed by the area beneath my big toe’s metatarsal. However, I no longer heel strike. I used Newton’s and Vibram’s to shift to a mid-foot strike to avoid injuries I thought were being caused by heel striking. So now my initial landing is on the outside of the mid-foot, right where the 5th lug is located. I’m definitely impacting the outside lug on the left foot more than any other part of the shoe. There may also be a bit of scraping as that part of the shoe begins to contact the ground. That explains the wear pattern, but it doesn’t explain 120 miles. My Altra Provision 2.0 which were in rotation during the same training cycle as the Newton Distance SIII have about 200 miles on them. The wear pattern is symmetrical and barely visible. My Brooks Pure Cadence, 2 pair from 2014 and 2 more pair from 2013, all have around 200 miles of use. The wear pattern is symmetrical and barely visible. My Newton Gravity from 2012 look like they’ve been barely worn and have 500+ miles of use. My concern is that I don’t know why that particular lug wore down so severely. You would think I’ve been riding a bike and dragging my foot to stop. That’s how bad it looks. Given Newton Support’s misdiagnosis and lack of interest in pursuing the issue further, I’m not sure I want to spent $150 more on another pair just to see if it was a fluke. My other issue with Newton shoes is not new to the Newton Distance S III, but it was a bit more severe. The shoes have to be tight to keep your metatarsals right where they need to be over the lugs. That tightness, in my experience, translates to pain right where the laces tie together if you run far enough. If you’re staying below 1/2 marathon distance, you may not even notice. At 10K or less, I never notice a problem, but on a 20 miler earlier this year I did enough damage that I was having trouble tying any of my shoes properly for weeks. 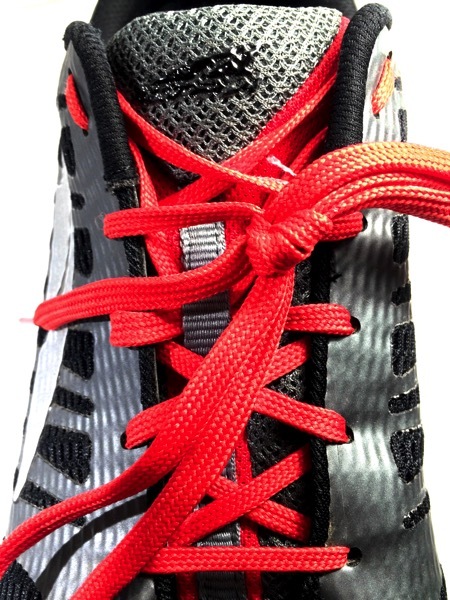 I had to use some creative lacing techniques to be able to run a 1/2 marathon at the end of April and a marathon in early May due to the pain from that one 20 miler in my Newton’s.